T H E R E A L D E A L I N - A U T H E N T I C - C O M M O D O R E 6 4 M U S I C ! 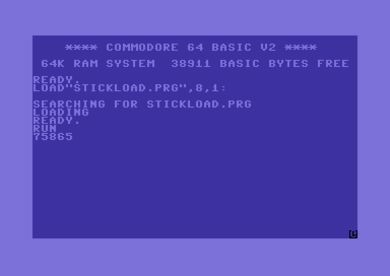 This code is not mine, I was lucky to find a technique to allow MMC64 to autoboot a program once the Commodore 64 was switched on. I'm not a assembly expert, and I did notice if the imported code was too big trashed bytes started to appear in the listing. So, whatever that means it doesn't matter, as I ended up only needing 1 single line of code anyway (see step 2 below). The assembly code was found (and then modified by me and Waxhead prior to compiling). It was compiled using "DASM 2.20.11 20140304". The final BOOT.BIN you can include in your own project in case you have severe problems getting such techniques to function yourselves. 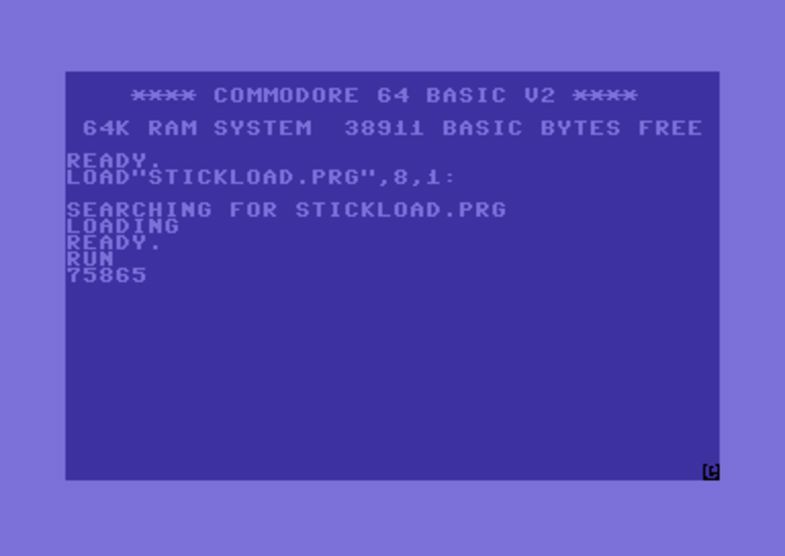 Just remember to replace the bytes in the BOOT.BIN ("STICKLOAD.PRG") to your desired loading filename from a ,8 device (Floppy Disk or other means of ,8 device emulation for Commodore 64). ; execute the included program automatically. MMC64 is disabled. ; ROTS (Return of the SOASC=) project 2015.
; area then bad things happen. was saved as .PRG file, then included into the assembly project included into the SYSTEM64/BOOT.BIN explained above. When executed from the MMC64 Cartridge automatically, it will simply load my "STICKLOAD.PRG" of the ,8 device of SD2IEC's SD Card. The reference to #15,8,15 is to open up control channel on the SD2IEC device and default back to root on the SDCARD (since we are changing directories on the SDCARD depending on HVSC release and PAL/NTSC variations so that we can load the PRG file needed. A even similar simple BASIC program was created, saved as .PRG, then EXOMIZED (to ensure it does not locate itself in the BASIC area, as other SID BASIC based tunes would be trashed or junked if I didn't). The exomized PRG file was placed onto the SD2IEC SD Card into ROOT, together with the needed PSID64 SID to PRG converted files, all formatted as a 8 numeric filename, like "00010001.PRG". Further by using the control command channel #15 on SD2IEC device, we can also jump into the appropriate SDCARD directory when dealing with multiple HVSC releases with PAL/NTSC variations. First it detects 2 characters (for HVSC release ID number), then 0 or 1 for PAL or NTSC, and finally a 8digit filename .PRG reference. Simply output and stores a number sequence of 8 numeric chars which are read from joystick port movements, .PRG is added to the final string which automatically starts loading when it reached a max number of 8 digits. The number will refer to an PSID64 SID to PRG unique file which contains the music to be recorded. The actual working BOOT.BIN for MMC64 (place into SYSTEM64 directory).